We went to see Wreck-It Ralph today with some friends. After 4 days of no power... and now 6 (and counting) days of no cable, phone, or internet... it was really nice (and necessary) to get out and see something new. 1. The Humor - Zoe's favorite - Specifically... when Ralph tells Sour Bill to "Stick Around" after sticking him to a lollipop in the "Sugar Rush" game land. She actually liked all of the humor though. She's already been repeating all of Vanellope's lines about Hero's Duty (Doody). They really got the kid humor down (and my sense of humor totally gets the kid humor too). 2. The End Credits - Ana's favorite - When it said "GAME OVER"... which is actually right before the end credits start running. While I believe part of her reasoning is that it meant the movie was over... the end credits were pretty cool. She made us sit and watch some of the credits and they showed scenes of Ralph visiting other games (mostly retro games I believe). Loved Ralph and Fix-It Felix playing with Q*Bert! 3. The Characters - My favorite - I loved how all of the characters related to each other outside of their games (in a Toy Story come alive when no one's looking kind of way). I liked the new characters and I LOVED how they incorporated the retro characters. (I always had a special place in my heart of Q*Bert) And my favorite character? I loved pretty much everything about Vanellope Von Schweetz (the glitch). Her sense of humor. Her "pixlexia". Her confidence that if she was just given a chance she could win. Love her! Ana's not so favorite? When I first asked Ana what her favorite part of the movie was she said "none". So... not the 4 year old's favorite movie. (Probably why she settled on "GAME OVER" as her favorite part.) She was a little afraid of the whole "Hero's Duty" game land. She was really not fond of the Cy-Bugs. She also didn't really like when King Candy was mean to Vanellope (or anyone else). When Ana gets nervous in a movie she announces that she has to go to the bathroom instead of saying she doesn't like it. Wreck-It Ralph had us in the bathroom 4 times. That's the most we've been at the movie bathroom, I think ever. I'm definitely going to have to see Wreck-It Ralph again on DVD. 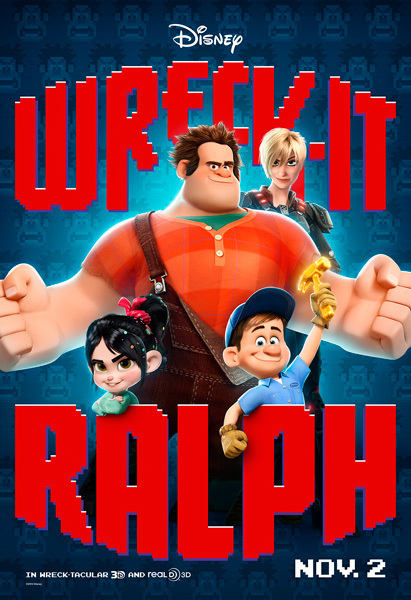 Did you see Wreck-It Ralph? What were your favorite and not so favorite parts?